Denver’s transit network is growing, but no government body has taken responsibility for improving access to train stations and bus stops — not RTD, not Denver Public Works, not the Colorado Department of Transportation, not Denver’s elected officials. It’s the city’s low-income residents who bear the brunt of this failure. Those are the findings from a report released today by the transit advocates at Mile High Connects. Critical infrastructure like sidewalks, crosswalks, bike lanes, and safe bus stops are known as “first and last mile connections.” They enable people to get to and from transit stations without driving. In Denver, there is no citywide source of funds for these connections, according to the report, leading to patchwork infrastructure throughout the city — especially in low-income neighborhoods. Although sidewalks are people’s highest priority, agency budgets give them short shrift. Instead, sidewalk maintenance falls to property owners in Denver, where most transit riders in the region live. This policy creates a system where low-income residents are asked to shoulder the burden of basic public infrastructure. The haphazard presence of sidewalks also hinders people from connecting to transit. If Mayor Michael Hancock and the City Council wanted to, they could pass an ordinance to ensure the city’s poorest neighborhoods don’t have the poorest sidewalks. The report offers concrete solutions from other cities — even Denver’s suburbs — to create robust sources of sidewalk funding. Westminster adds a fee to utility bills, for example, while Ann Arbor, Michigan, raised funds for sidewalk repair from a voter-approved tax. The report revives a 2002 idea from DPW: fund sidewalks through a property fee of $1 per linear foot (accounting for inflation, the fee would be set at $1.25 today). Set separate mode share goals for walking, biking, and transit, to guide funding priorities. The city wants 15 percent of all trips to be taken by bike or on foot by 2020, yet it only allocates 6 percent of its transportation budget to these projects, Locantore said. Incorporate sidewalks into routine roadway maintenance. Track spending on sidewalks, maintain an inventory of pedestrian infrastructure, and monitor sidewalk usage, so the city can make data-driven decisions. First and last mile connections are about more than sidewalks, and the report gets much deeper and more specific. 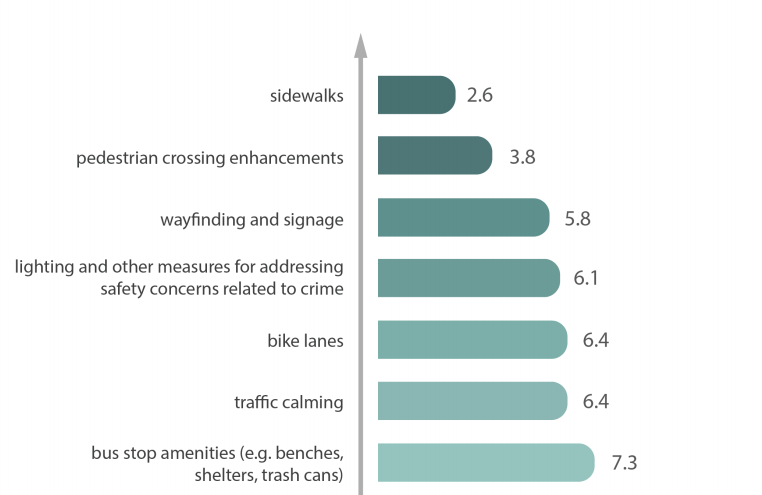 Stay tuned to Streetsblog Denver for other findings from the report. This post has been changed to accurately convey the funding proposal’s fee structure, which would charge property owners per linear foot, not square foot. In Germany a lot of the bus stops are maintained by private companies, most notably Wall AG, which seems to have a near monopoly on this business. The companies build the bus stops in exchange for the right to advertise there. Recently they have started providing free public Wifi as well. IT’s a simple way to turn a public amenity into a profit center. I believe the old DPW sidewalk fee proposal calls for a fee of $1-$1.25 per linear foot of property facing a public right of way – not per square foot. If it were per square foot, that would be a lot of money for some property owners! Just wanted to make that correction. Quite right, it’s per linear foot of street frontage, not square foot. I highly recommend that people link through to the report and two other info sheets at http://www.walkdenver.org/first-last-mile-connecting-people-to-transit/ — it’s readable and compelling. 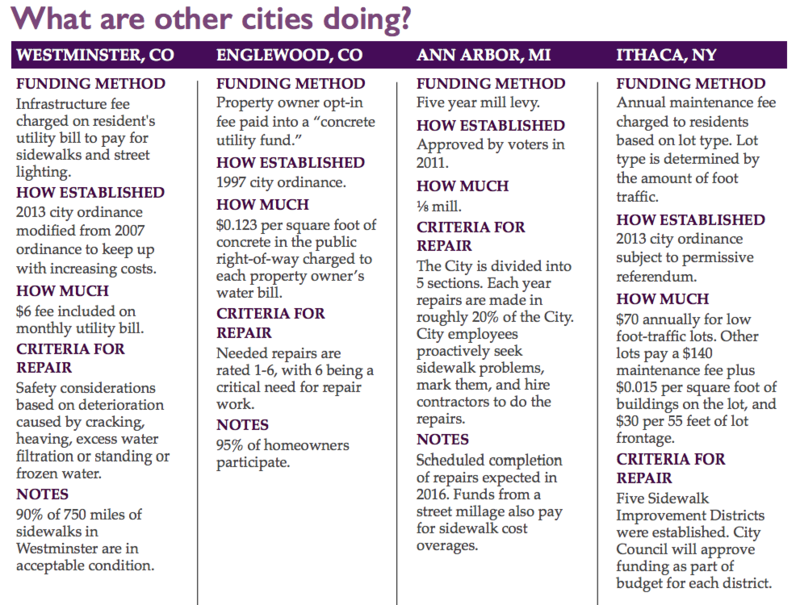 Nice slide of different cities’ funding systems. I happen to live near Ithaca, NY (not in the city because there isn’t enough housing in the city due to zoning, but that’s another matter…). The sidewalk ordinance has led to massive, massive improvements in walkability in the city within less than a year. Excellent post Streetsblog Denver. Look forward to follow ups.